While 7 1/2 months pregnant, I found out I was having a girl. It was my desire to create a hand-knit blanket to snuggle her in upon arrival. During a trip to my local yarn store I began my search for the perfect yarn. Instead of the soft, pastel colors I would typically gravitate towards I chose a cotton yarn in pink sapphire; the bright color caught my eye and I assumed it would do the same for my baby. Yarn as soft as Ultra Pima by Cascade deserved bamboo needles, so I reached for my favorite circulars in a size 6. Once home, I came across a unique stitch pattern for tilted blocks with lattice and cast on immediately! I chose a seed stitch border, hoping the texture of it would someday entertain the fingers of my little girl as she ran them up and down the edging. Part of the joy in knitting the blanket was the ease of the pattern. Within a few inches I had it memorized! It took just 8 hours to complete, and before I knew it, my pregnancy too was complete with my sweet Callie at home in the blanket purposed for her. 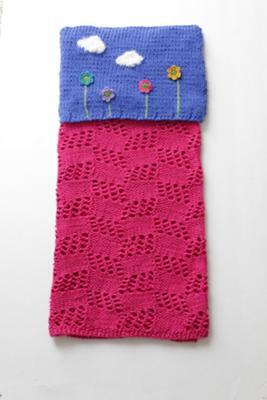 Since the blanket I knit resembled a garden trellis, the idea of a "secret garden" popped into my head. I recalled a quilt my mother made with a pocket on the back that allowed the blanket to be folded into a pillow. "That's it!" I assured myself. 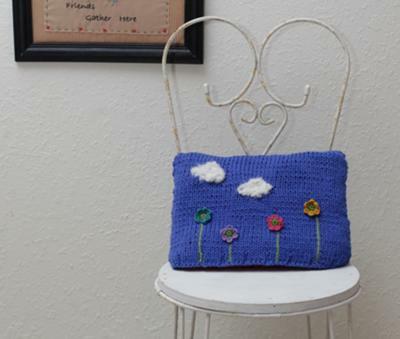 With that as my inspiration I knit the pillow pocket in stockinette stitch and used flowers and some leftover yarn to embellish the garden. A boucle yarn worked well for the clouds to create depth and some leftover cotton from Hobby Lobby "I love this yarn" completed the stems. Petal by petal, the garden was complete! Now when the blanket is open it has a pocket on the back; I imagine this will be a fun place for Callie to hide treasures in when she begins crawling. I learned some useful tips along the way: Gauge was important in determining the size of the pocket. (See explanation below). I also discovered the importance of blocking pima cotton; once blocked,the pattern of the tilting blocks popped! Most importantly, I learned that projects aren't always complete when you bind off. Sometimes we can re-purpose an item and knit new life into it. Here's the "Secret in the Garden"
Work 4 rows in seed stitch, which is (k1,p1) across all stitches. Repeat until desired length and finish by working 4 rows of see stitch and bind off. Find the measurement of 1/3 the width of the blanket; this is how wide your panel will need to be. *Find the measurement of 2/3 the length of the blanket: this is the length of the pocket (since the pocket gets folded in half). Use your gauge to determine how many stitches to cast on to obtain your measurement of width. I cast on 45 sts. I chose to work 4 rows of K4, P1 just to pull the top section in. 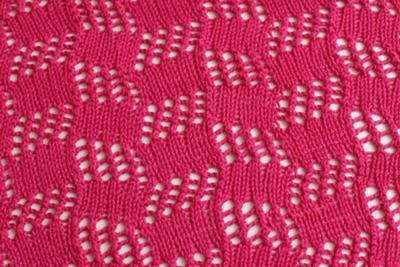 Now work in stockinette stitch until you reach the halfway mark of the pocket measurement. Switch to reverse stockinette stitch and work until it almost the same length previously knit and finish by repeating the 4 rows of (K4,P1). Fold the finished piece in half. Hold the piece so that the folded section is at the top. (The pocket gets sewn upside down). Now embellish the area beneath the rib stitch to the fold line. Here's the important part: Lay your blanket out and locate the top center 1/3 of blanket. This is where your pocket will be sewn: YOU MUST SEW THE EMBELLISHED SIDE FACING THE BLANKET- so that you cannot see it. That is the "secret garden" that won't be revealed until the blanket is folded into a pillow. Using a tapestry needle, position the pocket so that the fold is at the top of the blanket's edge. Sew through both layers of the pocket on 2 sides. To fold it into a pillow: Picture your blanket in thirds and fold the outer 1/3 on each side to the center so that you have a narrow strip. Turn the pocket over the top of the blanket to the other side so that you can see your "garden". Now starting at the bottom of the blanket fold it in thirds and tuck it into the pillow! Using the math above and the idea of thirds, you can add a pocket to ANY rectangular blanket you make. It makes a great baby gift because it wraps itself up! Your idea is great. But you could buy an unique garden decor to arrange your backyard and to spend more time in the nature with your baby. Children need fresh air to develop well and to be healthy. This is way is important to spend more time outside the house instead to stay all the time at home. Sorry that I copied the way you prepared the cloth for your kid and I prepared one for my kid but with different patterns. You mostly did cross-legged, but I did it simply like squares in a chess board. After finishing I write my college paper with this idea and finished knitting it in just 2 months. I too have started knitting this blanket, which I really like - however I have also found the pattern to be wrong, and I am only a beginner knitter, so do not really have the skills to correct it. Beautiful blanket! In fact, i like it so much that i attempted to make the pink portion myself. Unfortunately, the pattern listed on the site is incorrect. I was a couple hours into my knitting before realizing how wrong the pattern is. Now I'm debating ripping it all out to start over with my own pattern or continuing with imperfections. I suggest either correcting the listed pattern or removing it entirely in order to save others from disappointment. Thank you! I had a blanket in the contest, too, but this was my absolute favorite! So happy you won! Congratulations! Love it Summer! 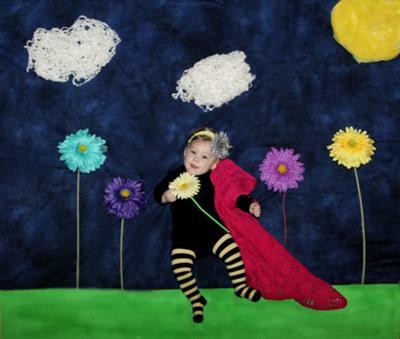 You are so creative, and I know sweet Callie will love it. Looks like she already does! I just love this! So adorable!